Honestly, there is nothing "reasonable" about quitting the game because it's not like the previous ones. But there is nothing fun to make the same game over and over with little to no changes. Have to accept that. Complaining about bugs, glitches or imbalanced stuff is one thing but saying "I'm done because bfv isn't a copy of previous games" is completely another case and there is nothing reasonable in such statement. But keep telling that to yourself. Actually, what I keep telling myself is, I can help this guy reach 50 rage posts and help him achieve that Rage for no reason medal. And what makes you think I'm raging? Care to explain? Are we talking about the same company here? I mean, EA has lost every connection to a big part of their former target group and that might be an understatement Gaming Companies are led by business economist which know nothing about games. The only language they talk is money. 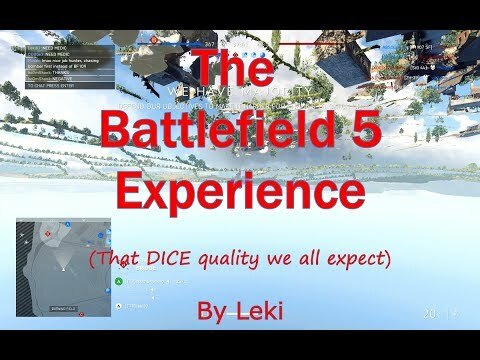 A lot of good points, BFV is a huge disappointment. Disappointment for you, but not for me. I am loving the game and even more excited for bug fixes and new content. I am from the age of where we played games for fun not for progression. Don't get me wrong, I like progression as much as the next guy but Ill take gameplay over progression anyday. And yes, I love the gameplay. Alot of whinning. Yes, the game has bugs. Ofcourse bugs are annoying. But some people aren't complaining about bugs, they're complaining about content. I personally play only conquest and only 5 of the 9 maps. I have no interest in any cosmetics, skins or assignments. Yet I'm having alot of fun playing the game every day. How are you people bored exactly? Nothing better than being in the village of Arras with tanks rolling in and your house begins to fall. It's especially bad after BF1 which is one of the most fun FPS games I have ever played, while this is probably one of the least fun I have ever played. Add to that the sales are half of BF1, I think that counts as regression. Agree. If it was not for air i would not play this game. And even that need a lot of work before it's good. Honestly, I'd think the guy with over 4200 posts wouldn't worry so much about how others waste their time, but hey, what do I know? If you asked my wife, not enough. Besides the rampant cheating, TTD, visibility and no rewards at level 50 the games is GREAT!